Editor's Note:We will hear for several weeks how sports unite us, break down barriers, and celebrate the human spirit. Of course this is over-idealized marketing for the most part, especially if you know the mess around the Olympic venues this year. But the hype speaks to a deep yearning in our human spirit that still resonates with the intentions our Creator: that folks from "every nation and tribe, people and language" can be united on something. 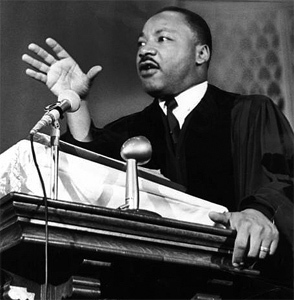 Of course that quoted phrase comes directly from God's dream, which also became Dr. King's dream, and it will find its fulfillment in the place that Dr. Martin Luther King, Jr. knew it found its source: Jesus (Revelation 7:9-12). — Phil Ware. I don't know the writings and sermons of Martin Luther King, Jr. very well. That strikes me as an unfortunate thing, for the little I have read and heard lets me know that he sounded themes that people like me needed to hear in a time when so many of us white folks were excusing ourselves for not listening. A sermon he preached in May of 1966 was published only recently. That was about two years before he was assassinated. He spoke eloquently about three biblical guidelines for churches to follow for the sake of being "constructive churches" in a world where so much still needs to be put right. The world won't applaud, but it is still right. From this text, he allowed that the same mission that Jesus announced for himself is the mission his people are expected to carry forward in the world. We are to give hope to all who are brokenhearted by bringing good news to the poor and proclaiming the year of the Lord's favor. I especially appreciate what he said about the year of the Lord's favor, or — as translated in some of the older versions — the "acceptable year of the Lord." In quick summary, he listed several specific things this would entail: "The acceptable year of the Lord is not some distant tomorrow, which is beyond history, but the year of the Lord is any year that men decide to do right." So he talked of righteous personal living, all nations abandoning war, our politicians learning to "do justice and love mercy and walk humbly with their God" (Micah 6:8 NASB). He challenged his hearers to live by the Golden Rule (Matthew 7:12), to recognize that all men on the face of the earth are of one blood (Acts 17:26), to join God's chorus in confessing Jesus Christ is King of kings and Lord of lords (Revelation 7:9-12). No, it won't be easy. No, Satan will not be pleased. No, the world won't applaud. But it is still right. 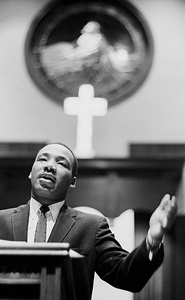 As Dr. King said, too many churches want a cushion instead of a cross. [Jesus said,] "If any of you wants to be my follower, you must turn from your selfish ways, take up your cross, and follow me" (Mark 8:34 NLT). "Do Our Churches Prefer Cushions over Crosses?" by Rubel Shelly is licensed under a Creative Commons License. Heartlight encourages you to share this material with others in church bulletins, personal emails, and other non-commercial uses. Please see our Usage Guidelines for more information.